What’s a person to do that wants to travel internationally but their checking account just laughs and laughs at them? 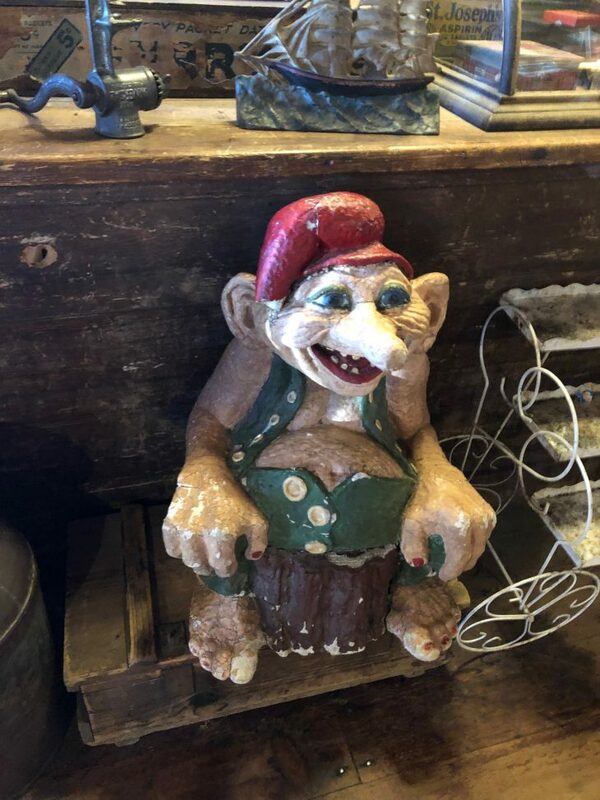 Well, if you’re like me, you search out fun and unique European inspired towns in the United States. I can usually afford a tank of gas, things on a writers budget don’t usually extend to international airfare no matter how hard I try to make it work. That’s ok though because America has so many places that feel like Europe that it’s easy to escape for an international holiday without breaking out the passport or breaking the bank. 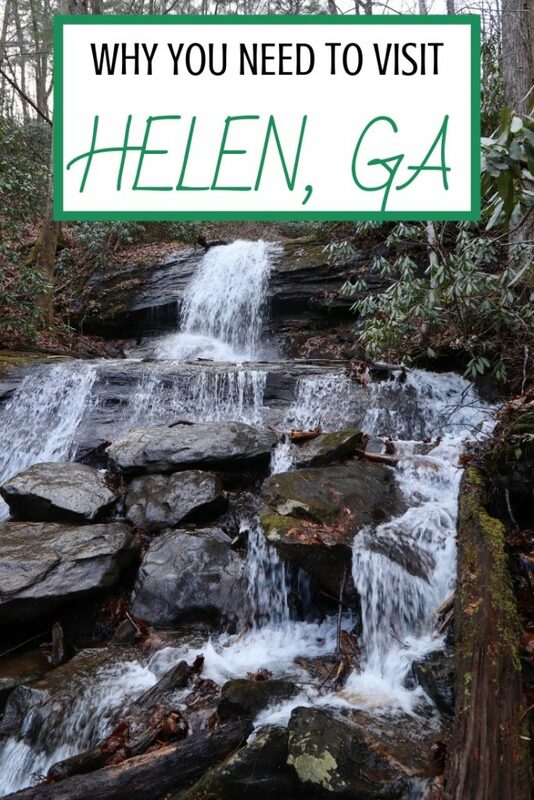 Case in point, Helen, GA. 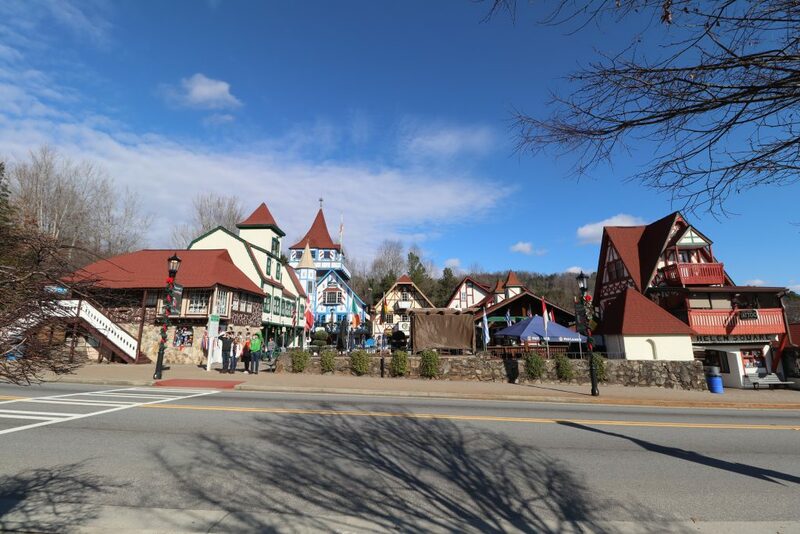 This small German-esque town has streets lined with Bavarian-inspired buildings, German restaurants and is located in one of my absolute favorite places….the north Georgia mountains. This year, Helen is celebrating its 50th anniversary making it the perfect time to visit as they’ll be celebrating throughout the year with special events and celebrations. 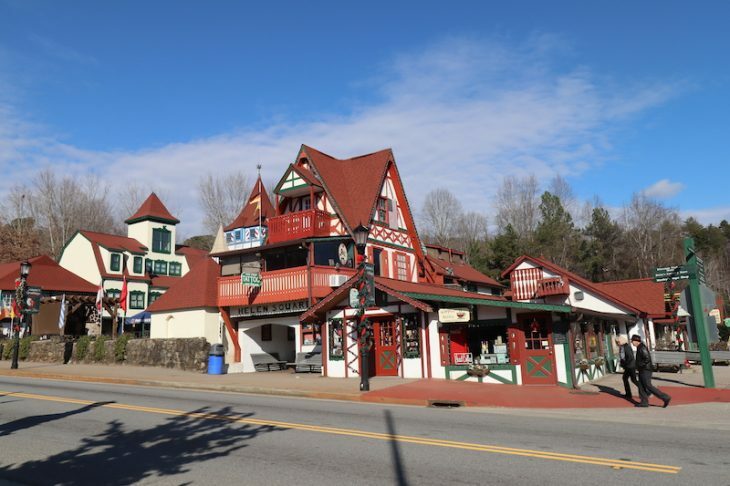 Valhalla Resort and Spa – 688 Bahn Innsbruck, Helen, GA 30545. Take a time out for some R&R at the Valhalla Spa. It’s a small spa (no relaxation room, small changing rooms), but the service is top notch. We left feeling relaxed, refreshed and that our legs could take on more miles of hiking. Folk Pottery Museum of NE Georgia – 283 HWY 255 North, Sautee, GA 30571. 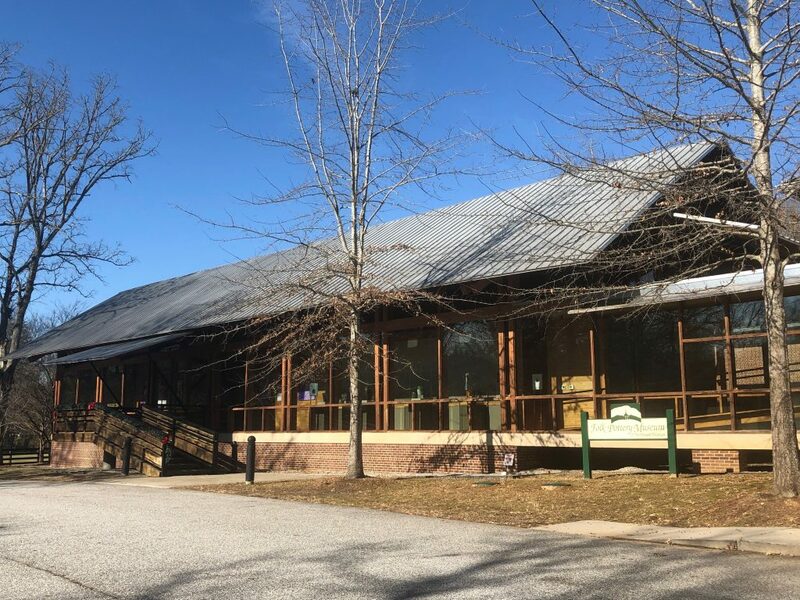 This region of Georgia is rich in the arts and the Folk Pottery Museum is a must visit to appreciate the skills of the artists in the area. 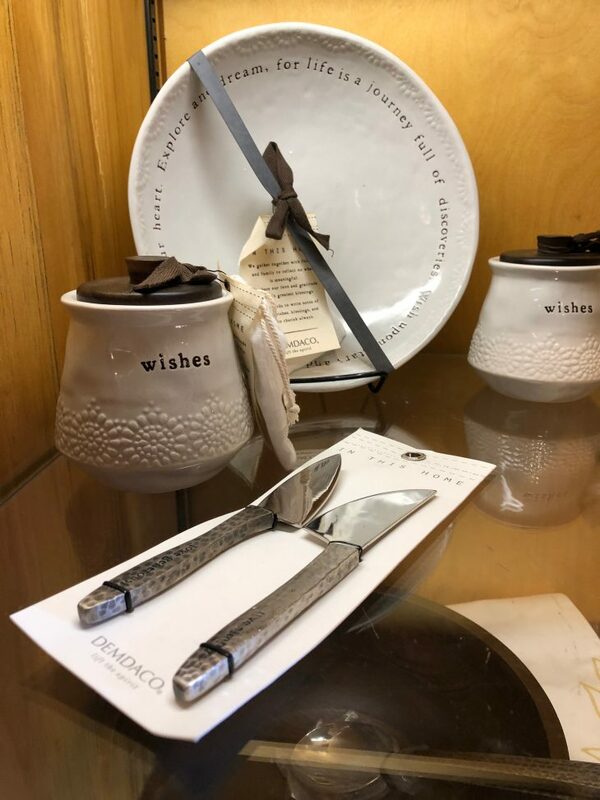 In addition to the museum, there is a museum store that has many different types of pottery available for sale. 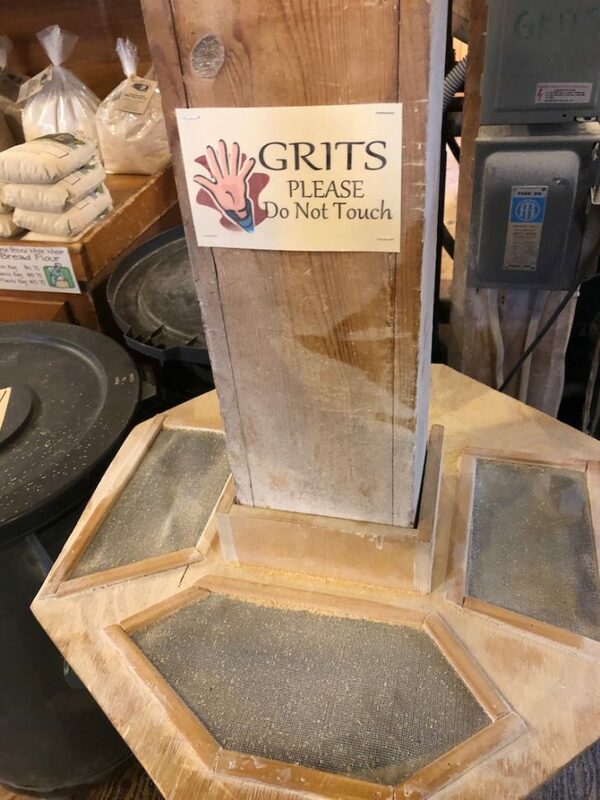 Be sure to stop here to buy the best flour and grits. Seriously, it’s a good thing they do a mail order business because I don’t think I can go back to anything else. It’s a working mill and you can watch as they stone grind grains. Lots of cute gifts for the kitchen beyond their epic products as well. Be sure to stop at the coffee shop next door for a cuppa joe. 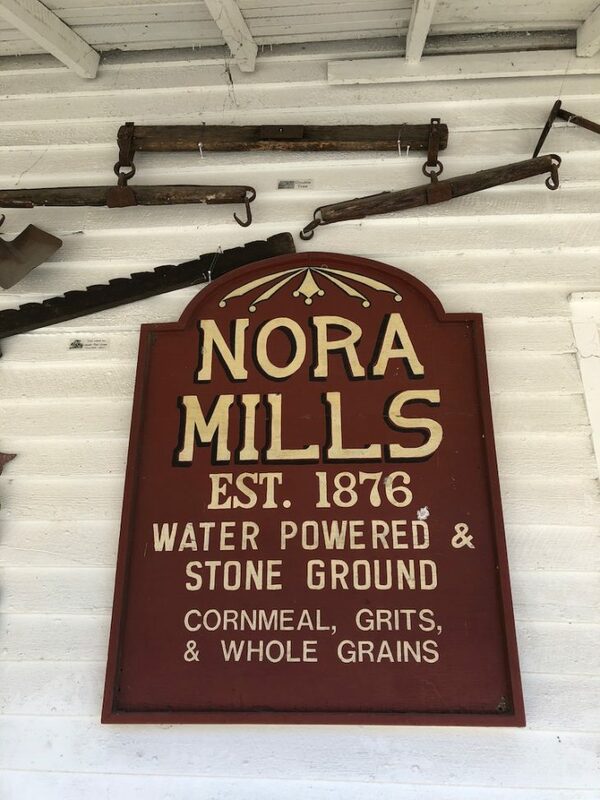 Located directly next to Nora Mills they are serving up fresh, hot coffee as well as roasted beans you can take home. 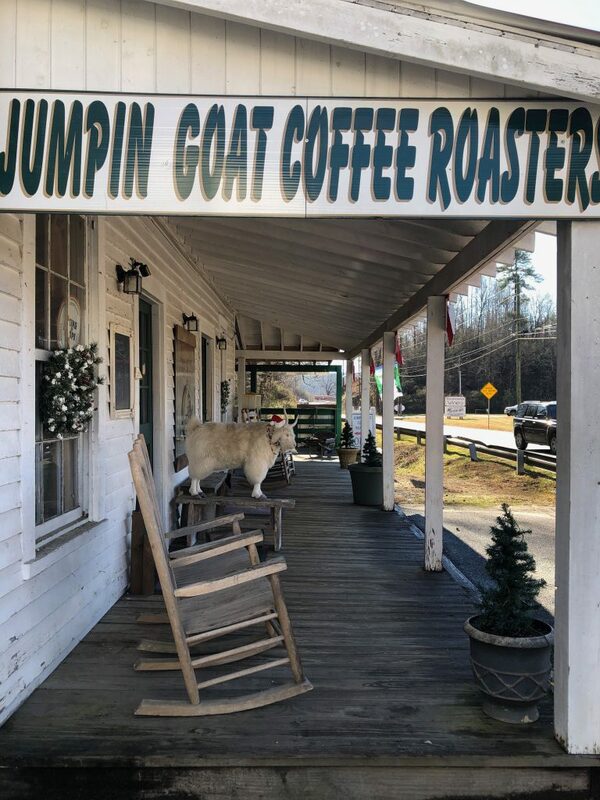 I’m always a go for local coffee shops and this one was so good we may have stopped by a number of times to get our coffee fix. 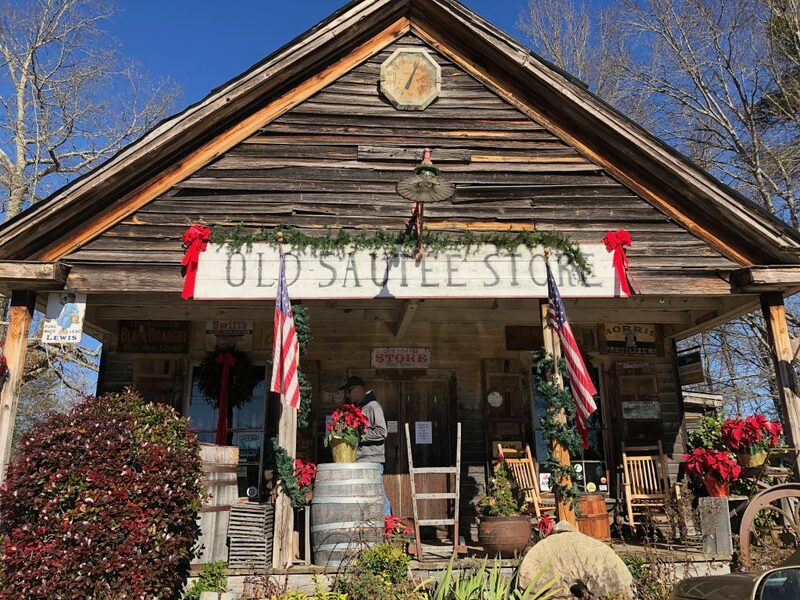 Old Sautee Store – 2315 HWY 17, Sautee, GA 30571. 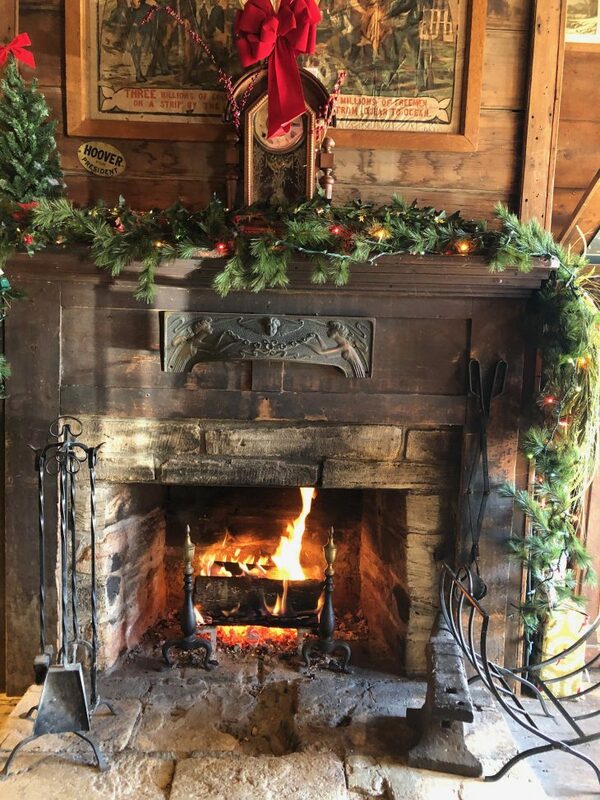 The front of the store is a small museum with a gorgeous fireplace. 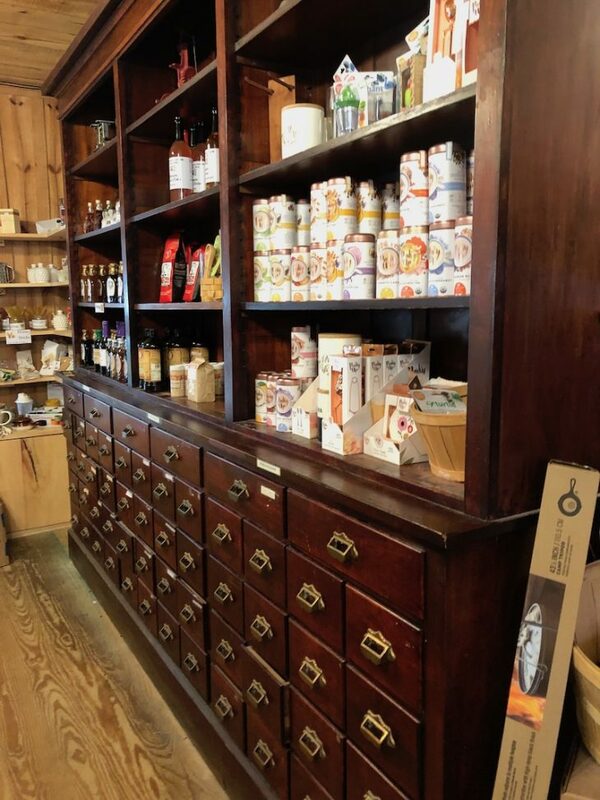 After you walk through the historical part you enter the “store” that has gift items and clothing. A great place to pick up gifts for friends and family back home. 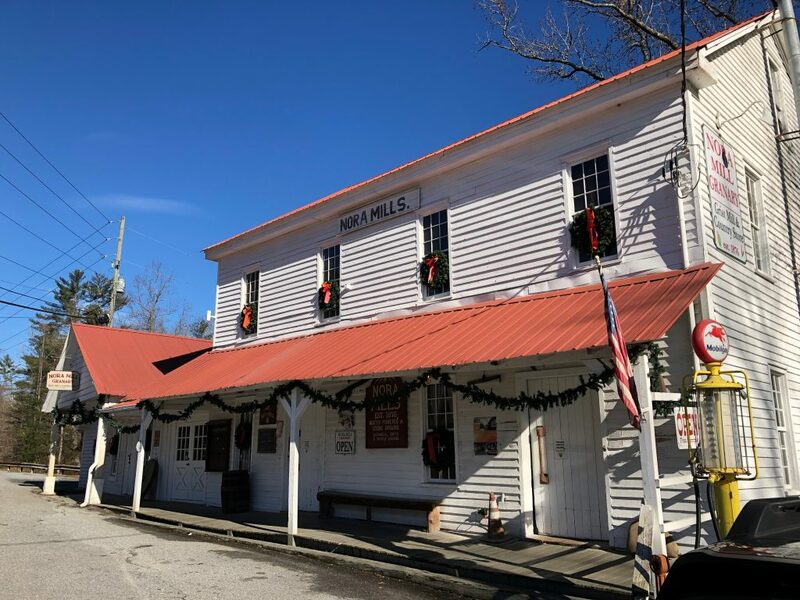 Wine tasting at Habersham Winery – 7025 South Main Street, Helen, GA 30545. Great tasting room right across the road from Nora Mills and Jumping Goat Coffee. Buy a bottle of Scarlett but be sure to try the others. There are lots of wine gifts as well. 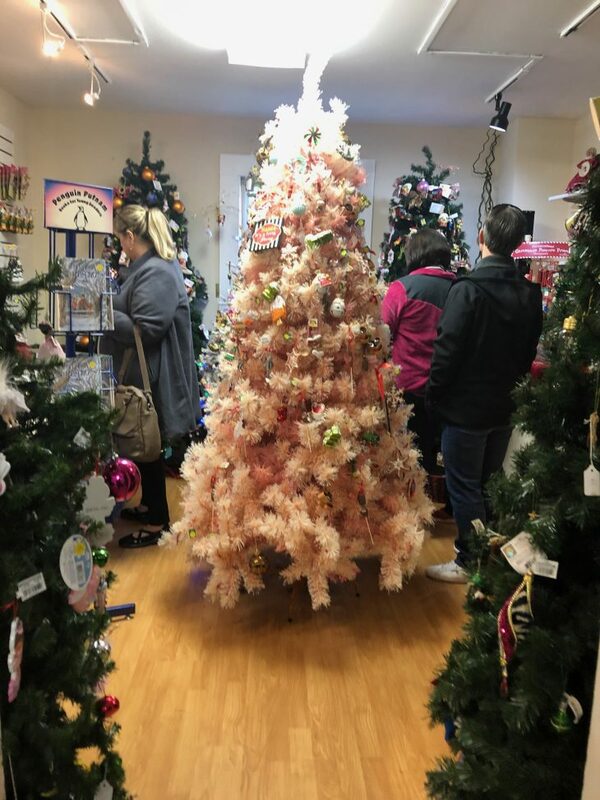 The Christmas Shoppe – 8749 N. Main Street, Helen, GA 30545. 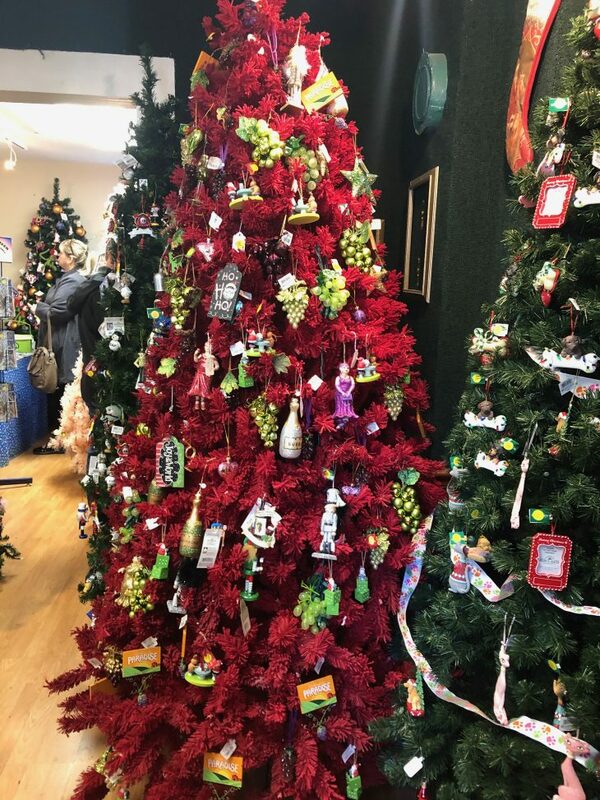 No matter the time of year be sure to make a stop at the Christmas Shoppe for holiday inspiration year round. 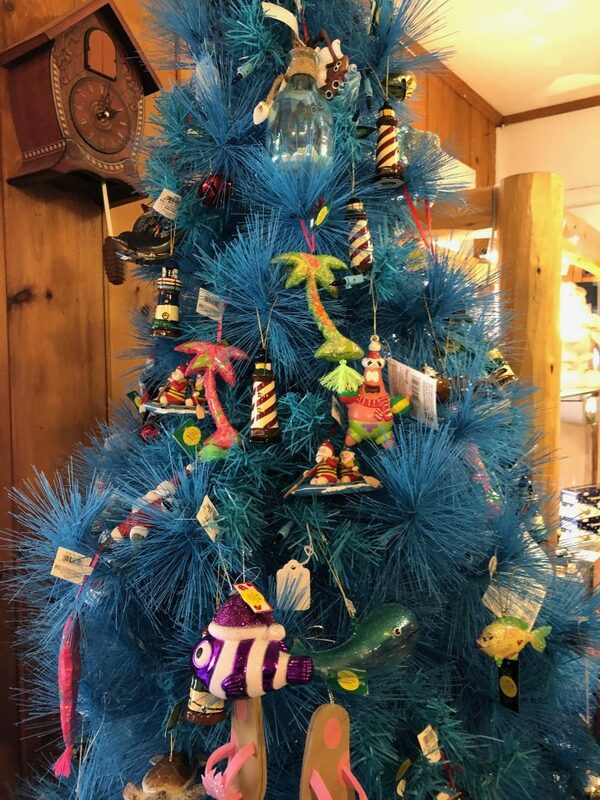 Their themed trees are awesome! The business district is just a couple blocks so it’s very easy to walk to everything. If you are staying at a local hotel in town leave your car parked and walk to the shops and restaurants. 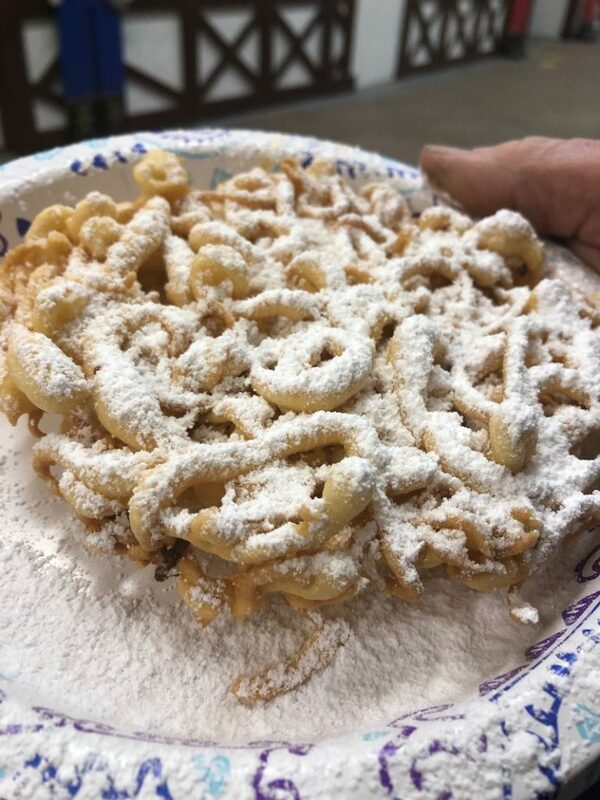 Bigg Daddy’s – 807 Edelweiss, Helen, GA 30545. Hot pizza, cold beer, live music, and outdoor seating. 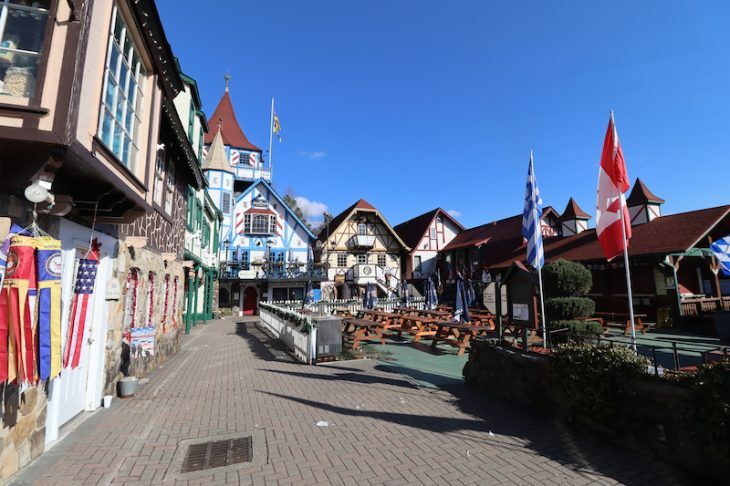 Great choice for authentic German food. Hofbrau Haus Restaurant – 2220 HWY 17, Sautee, GA 30571. Cowboys & Angels – 60 Chattahoochee Street, Helen, GA 30545. Fun place with live music and good food. They have a great brunch. 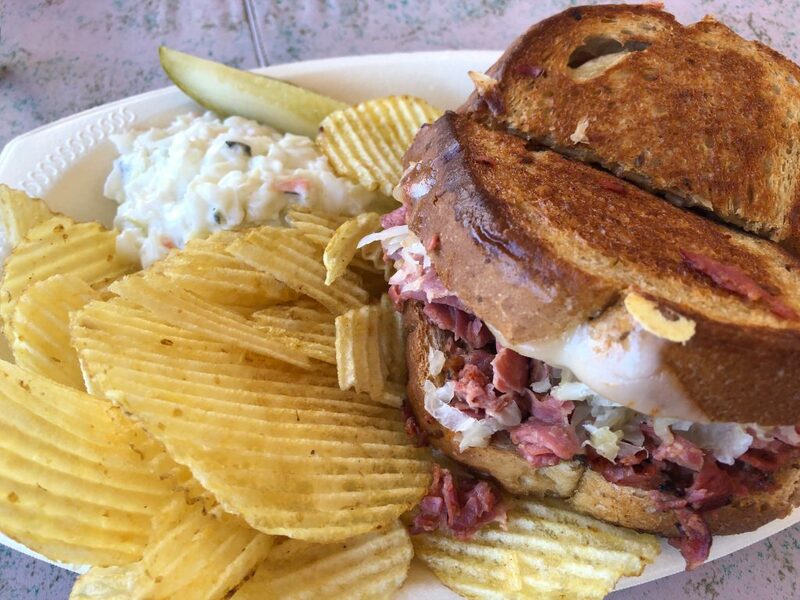 If you spend the day out this way for other adventures definitely stop in for a bite to eat. Hofer’s Bakery – 8758 N. Main Street, Helen, GA 30545. It’s a bakery, seriously, what’s not to love? The way I love taverns is the way Alan loves bakeries -lol-. It’s a win-win for both of us in Helen. Holiday Inn Express & Suites – 8100 South Main Street, Helen, GA 30545. The perfect location for your visit to Helen. 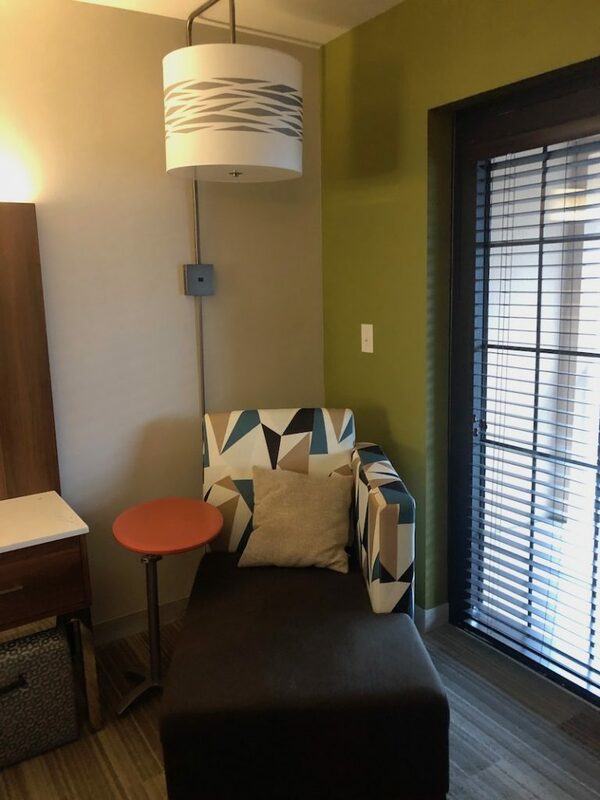 Walk to area restaurants and shopping to save money on parking, but still an easy drive to all the outdoor adventures and attractions that are nearby. 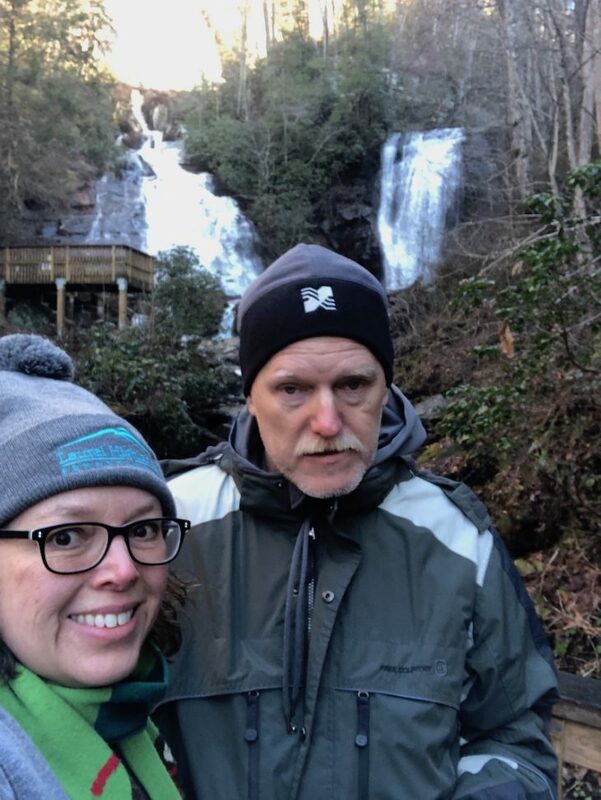 We visited in December so the cooler temps didn’t allow for any river time, but we did spend a fair amount of time outside hiking to waterfalls. Easy hike from the parking area to the falls. The path is paved making access to the falls incredibly easy. The viewing platforms can become crowded if you go later in the day. Stovall Mill Covered Bridge -2617 GA-255, Sautee Nacoochee, GA 30571. 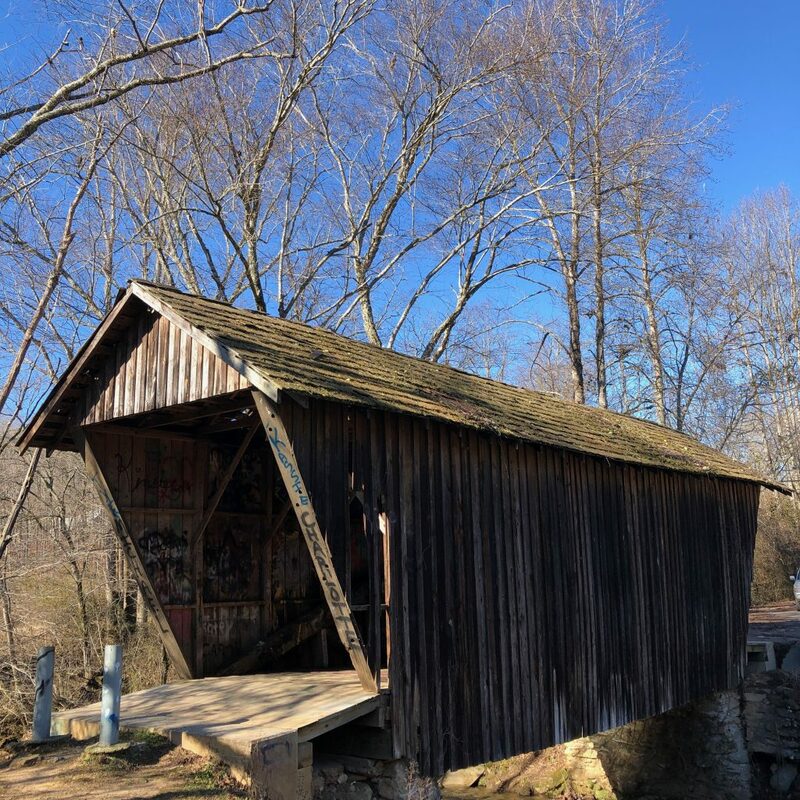 For covered bridge lovers, this 38-foot covered bridge from the 1890s was part of a mill complex. The mill and damn washed away in 1964 but the bridge still remains. Located at a small roadside park. For my friends that like a good ghost story it is, of course, reported that this bridge is haunted. It’s a story you would expect to hear. Standing on the bridge at night, you can hear the cries of unseen babies and the sounds of horse-drawn carriages. Crying baby bridges are found all across the United States and seem to be quite the popular story. I wasn’t able to visit at night, but I’d be willing to go back and check it out. 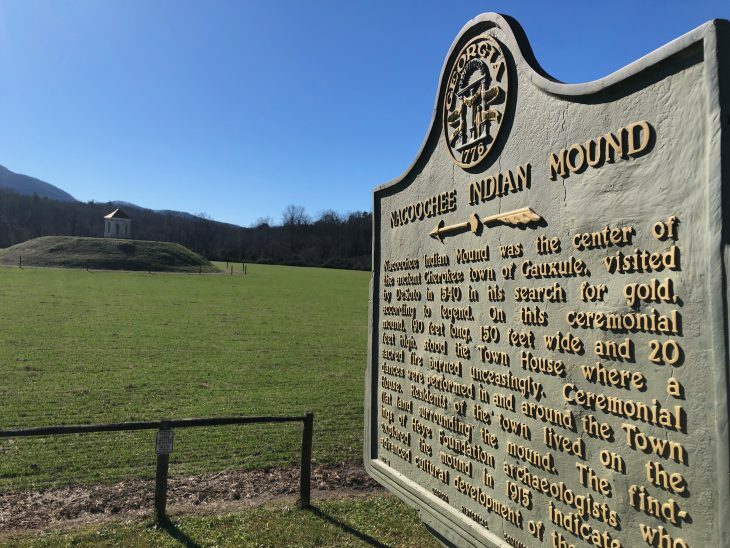 Nacoochee Indian Mound -7086 Unicoi Turnpike, Helen, GA 30545. Located a short distance from Nora Mill there is a small area to pull over for photos. 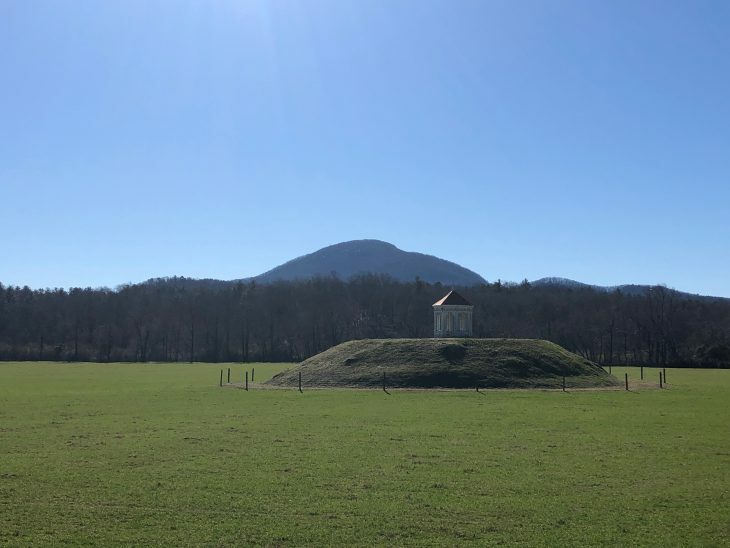 Originally the mound was an Indian burial site and years later was used as a site for ceremonial rites. The mound is listed on the National Register of Historic Places. 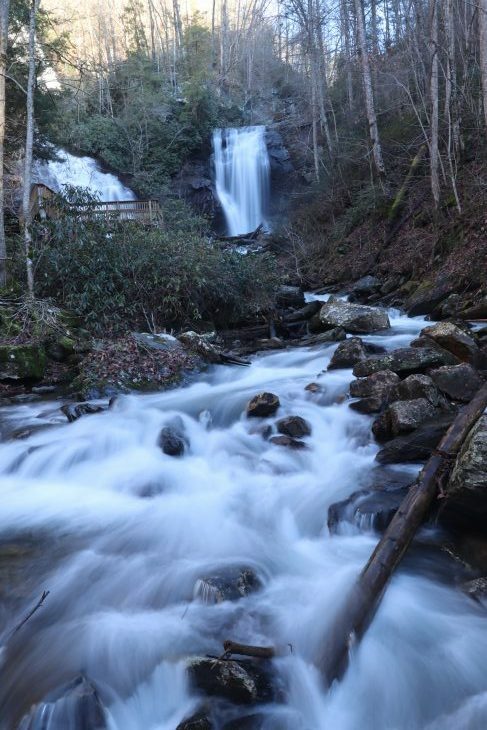 There are a number of adventure guides in the area that can arrange for you to participate in any number of outdoor activities. Seriously, this area has something fun for everyone. Take to the trees with a ziplining adventure or cool off on a float down the river. If the slow and steady pace of a horseback ride is more your thing you can do that as well. 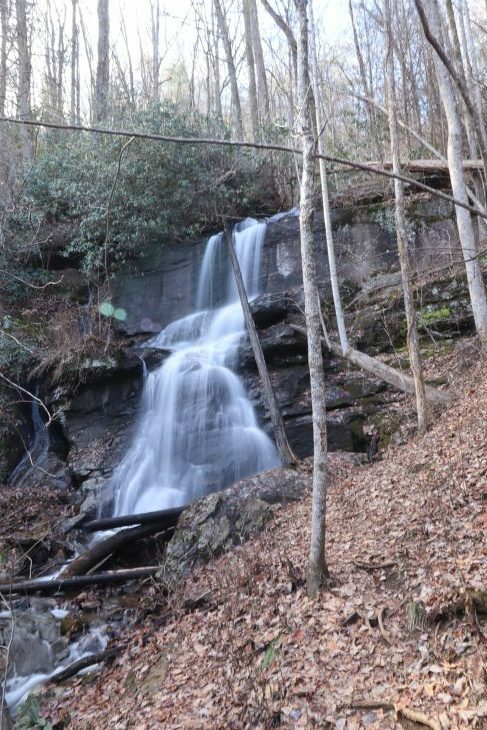 There is an incredible number of great hikes in the area. 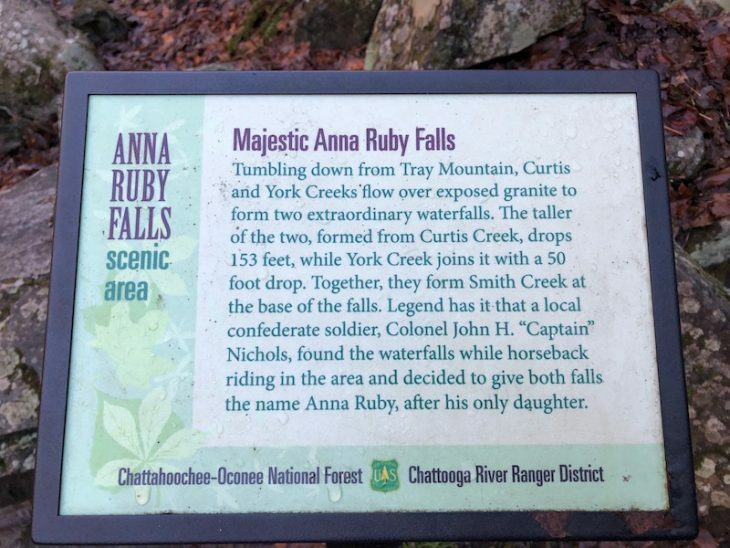 I wish I would have kept more detailed notes, but basically, we tried to hit all the nearby waterfall trails. 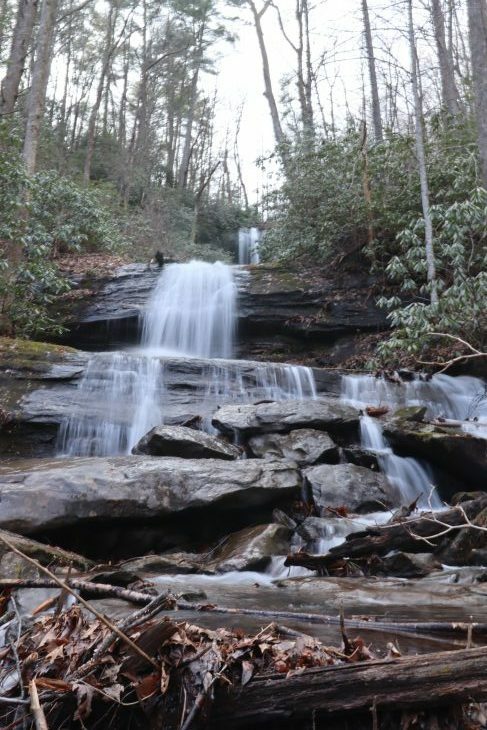 The trails were not too difficult and each one was definitely worth the hike! We met a lot of great people on the trail that were happy to suggest other trails and share their experience on the trail we were hiking. The locals were friendly and always willing to answer our questions. Outdoor peeps are the best! Baby Land General Hospital: – 300 NOK Drive, Cleveland, GA 30545. Seriously, probably one of the most interesting things we did while in Georgia. 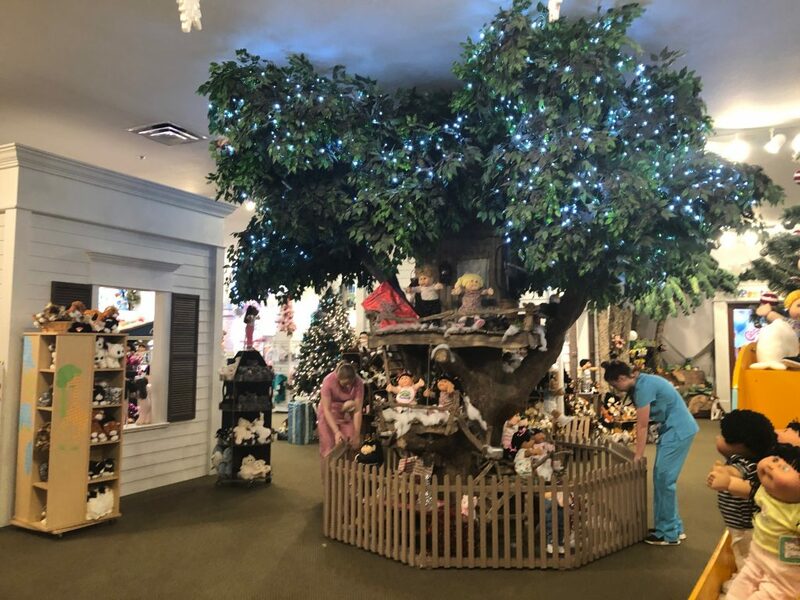 For adults and kids alike you would be remiss not to stop at Baby Land General Hospital: Home of the Original Little People and Cabbage Patch Kids. Cottage Vineyards & Winery –5050 HWY 129, Cleveland, GA 30528. Make a stop at the winery after your Baby Land visit to chat with your friends about the experience while enjoying some great wine. 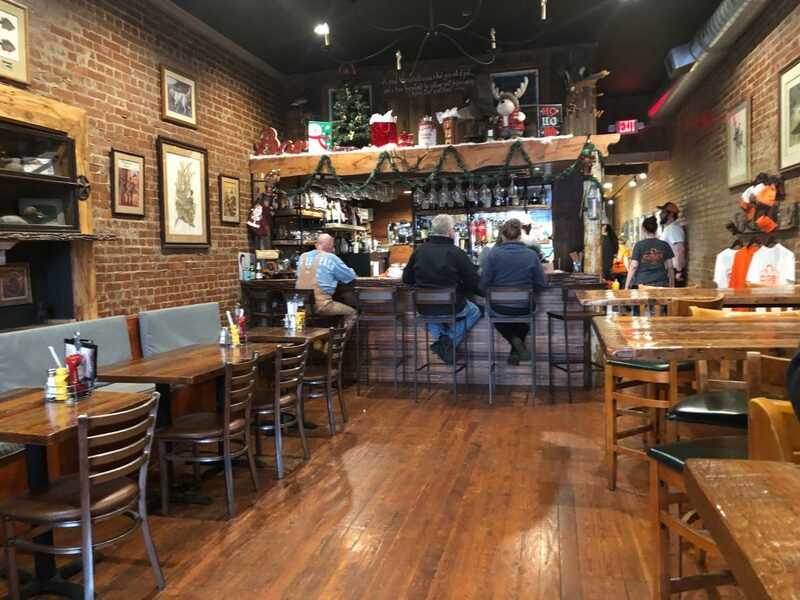 Clyde’s Table & Tavern on the Cleveland Square – 5 E. Jarrard Street, Cleveland, GA 30528. Fantastic tavern on the town square. 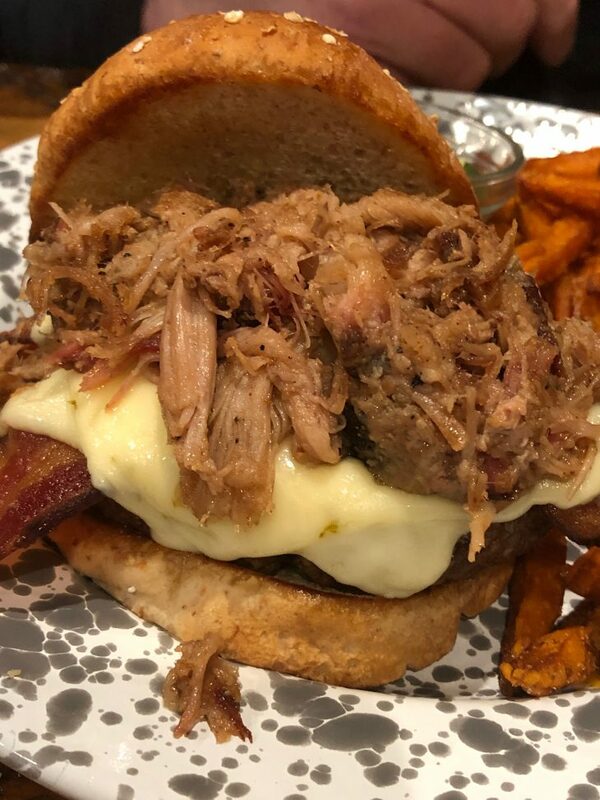 Order a burger with bacon and bbq on top. 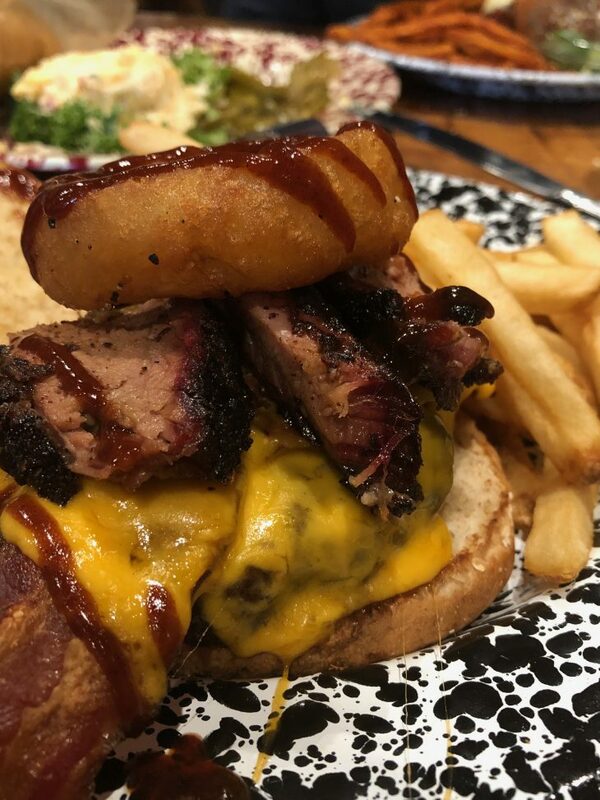 Don’t think about the calories. Just order and enjoy. 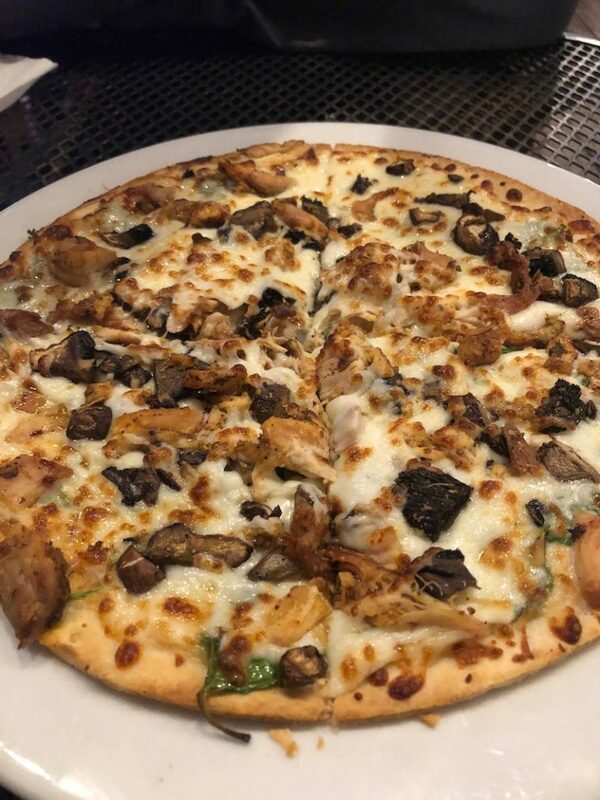 It’s worth every bite! 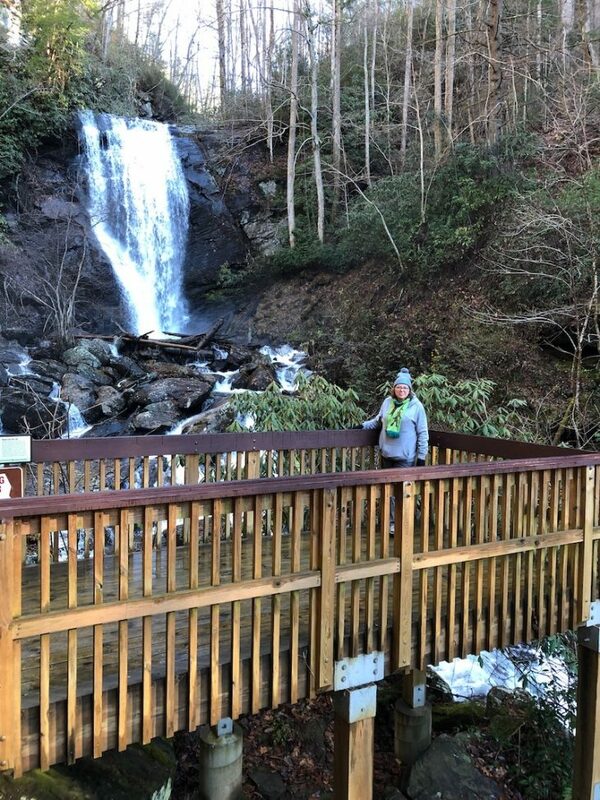 Helen, GA proved to be an unexpected delight and one that I highly recommend especially for outdoor lovers and those that love faux international travel without breaking the bank.